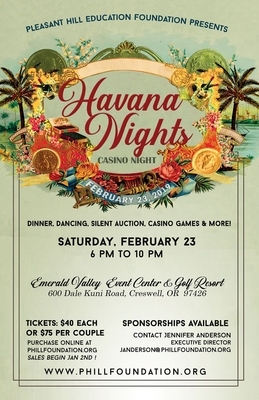 Words cannot express our thanks to the Pleasant Hill community for their support of Havana Nights! Your generosity helped us raise over $47,000 for the Pleasant Hill School District of which $16,000 will be directed to the Career Technical Education (CTE) program. A huge thanks to our Principal Randy Fisher who introduced CTE and our guest speaker Mitch Morrell, who delivered a heart felt and inspiring sharing of how the CTE program has personally improved his son’s educational experience and how CTE is being used in various industries today. Over 200 attendees enjoyed gaming, dancing and bidding on over 75 items in our live/silent auctions and gift card grab! Thanks to the many businesses and people who donated those items. A huge thanks you to our presenting sponsor, Aggregate Resources #ariinc and our Royal Flush sponsor, #rexius and our 29 other business sponsors (see below for a complete listing). Finally we couldn’t have done it without our Board of Directors and our Havana Nights Committee. This group of ladies are amazing and talented so thank you!! Enjoy these photos taken by #MembrantPhotography. There is no password so feel free to download and enjoy! Presenting Sponsor - Aggregate Resources Industries, Inc.